Remember when I wrote a review about Running Man few years ago? It’s the time when I overly excited about that show and spending most of my times downloading and watching RM (which still I do until now). Since I’m now on a love-stage-one situation with another SBS variety show program ‘Roommate’, I’m thinking why not give this one the same treatment. 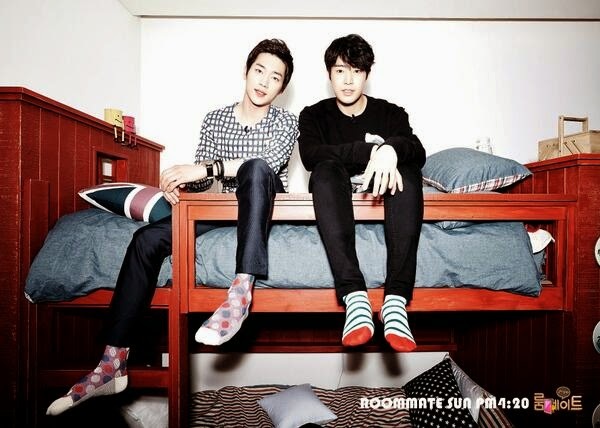 So this is why I decided to write a review on ‘Roommate’. 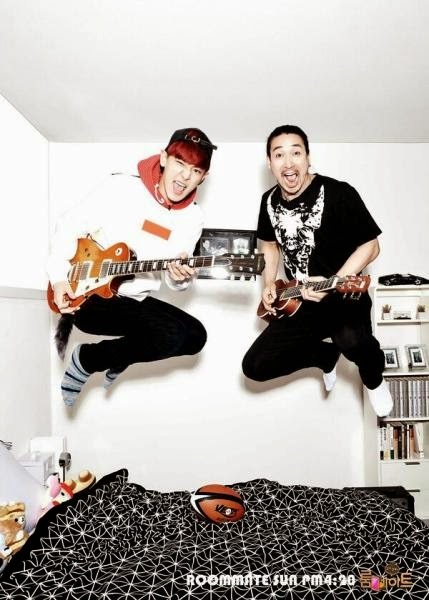 Before I reviewing any subjects on this show, let me tell you briefly of what is Roommate. 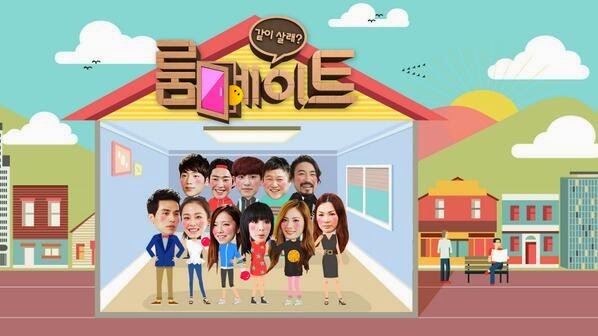 Roommate is another variety/reality program from SBS TV station. It airs every Sunday right before Running Man. Roommate give their viewers an interesting story of how 11 celebrities spend their life together at 2 story building as a ‘Roommate’. Despite of their status as a roommate, they’re still spending their days as usual with their daily activities and schedules. The interesting point is that they’re the one who manage the households, not the staff, which make them closer and live like a family. He’s the oldest member in the house. He is a rock singer who has been living alone for 30 years (amazing, right?). In an individual interview, Sung Woo admitted that sometime he felt lonely, especially when he visiting his friend house, and meet their son and daughter (pretty sad, I hope he finds his soul mate after Roommate). Chanyeol has been living with the other EXO members in dorm for about 4 years. In an individual interview he seems a bit worried about his image that may ruins if his fans saw his daily life activities. She’s the second oldest member in the house. She’s a supermodel which been busy with her schedule as DJ nowadays. Pretty same with Sung Woo, So Ra has been living alone for 20 years. She only lives with her cute little doggy named Giselle. In an individual interview, So Ra admitted that she thinks it will be hard to be living with others, since she’s been living alone for too long. Park Bom has been living with the other 2NE1 members, but since papa YG allowed them to moving out and live in their house, Bom is left alone in the dorm. She’s volunteering to join Roommate. She also picked by papa YG among 2NE1 members. She seems super excited to showing off her alien acts. Song Ga Yeon has been living in the dorm with other fighter. She seems quite excited, I think. She’s the flattest member in the group. He’s the third oldest member in the house. I think I don’t have to explain anything about this one, because I believe you know him well. What shocking to me is the fact that this handsome ahjussi been living with his mother! (shocking, right?) Anyway, this is the first time he separate with his beloved mother. Funny thing happen when Lee Dong Wook asks his mother permission to leave house. Jo Sae Ho has been living with his partner in small flat. He also seems excited to join Roommate because he wants to be close with celebrities (hilarious!). She’s the same age with Lee Dong Wook. Like Dong Wook, she’s also been living with her family. Opening the possibilities to meet her soul mate through this reality show, her mother really supports her to join. This flower actor is also been experiencing same condition with Nana. He lived with his actor friends in a small room (I literally shock when I saw his flat, I didn’t think that handsome actor also lived poorly). Park Min Woo has been living alone. I don’t have much information about him because they didn’t show much in the introduction. I barely know about this program even though I often scrolling along Korean entertainment news website. Not too long before it premiered I finally know about Roommate. Still, I don’t have enough eagerness to download and watch this show as soon as it’s airing. I just put Roommate like usual Korean variety/talk show I like, which I watched during my boredom of my top list variety show. But all of sudden I find myself downloading the first episode of this show right after I watch the newest Running Man episode (which super-duper hilarious!). It’s kinda shocking though when first realizing the duration. For a reality show, it is quite long, I think. But like most of SBS variety show, it never disappoints me. I love how SBS always make their every show tidy and interesting. It’s what we call in Indonesia as a program which has a strong ‘niat’ or intention. I always believe that the success result is based on a good preparation. The same thing with what Roommate did. The narration which explains the background of how Roommate made is the strong point from the second I watch this show. The writer even adds some research and reality of how people used to live. They even put on some ground rules about how the members should act in house. The introduction of the members also something I like. It shows that the writer put on some research before they’re choosing the member of the house. The variety of the cast makes a perfect combination. Each of them has unique personalities, which make this show even more excited to watch. the blossoming love between member of the House. Still, the editing process is the main power (beside concept and script) of this show. I sincerely hope that this show will be less scripted and more natural because I believe every member has the power to make the show interesting with their own abilities. They will go head-to-head with another popular variety program, which are MBC “Daddy Where Are We Going?” and KBS 2TV “The Return of Superman”. If the PD and writer keep their good works like first two episodes, I’m quite sure they can compete against those two. Oh I forgot to mention the house. It's ah-mazing! This is definitely my dream house. The room is superb and equipped with minimalist and high-standard furniture which beautifully portrays every member personality. Love love love! Anyway, my last comment is if you love watching K-Drama and listening to K-Pop, especially fans of variety show, SBS Roommate is definitely a show you should watch.